We take you to a healthy Mediterranean diet trip. Hands on classes will help you discover the local cuisine and wines. We are committed to ensure your culinary experience while visiting Santorini is unforgettable. Santorini is about food, wine and lifestyle. Arrival day, Welcome to Santorini! After arriving to Santorini, during your private transfer from Airport / Port to your beautiful Hotel, your personal driver will take you through a uniquely stunning landscape, to the one of the most picturesque and luxurious places in the world. …and it has been described as “one of the most beautiful places on earth”. This inviting, charming boutique hotel will be your home for the week. You will have time to unpack and unwind or to relax. Santorini, the mythical Atlantis? After breakfast, our first day will start with a visit to the Akrotiri Excavations, one of the most important settlements of the Aegean. Akrotiri is a Minoan Bronze Age settlement on the volcanic Greek island of Santorini (Thira). The settlement was destroyed in the Thiran eruption about 1627 BC and buried in volcanic ash, which preserved the remains of fine Frescoes and many objects and artworks. Here with our guide learn about the legends of Santorini, investigating whether it is the fabled Lost city of Atlantis. Discover evidence of winemaking that has been estimated to date back to the 3rd Millennium BC, making Santorini as one of the oldest winemaking regions in the world. Then we will continue with the mountain of Prophet Elias at 600mt of altitude and visit the old Christian Monastery from the 1700’s. Continue your wine discovery by strolling through the island’s basket vines at a traditional winery, and learn about Santorini’s unique viticulture traditions. The tour will finish with a wine-tasting. Discover the Mediterranean flavours of Santorini. Leaving our hotel after breakfast, our fabulous cooking day begins. Today you will learn how to cook like a Greek under the guidance of an awarded local chef at a traditional restaurant located in the eastern coast. Enjoy plenty of Greek appetizers, and come away with some classic Greek recipes. You will cook some traditional Greek recipes to impress your friends back home with! 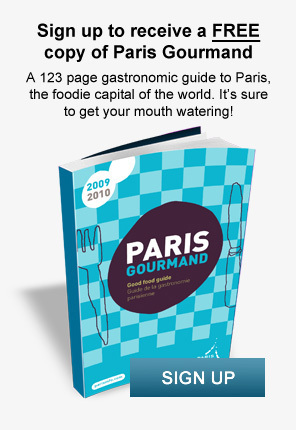 A true gastronomic field to table tasting dinner menu. Savour traditional Greek aperitifs such as Raki and Ouzo, and of course, you'll also get to enjoy the fruits of your labor at the end of your cooking lesson! Enjoy your fresh-cooked lunch at a traditional restaurant. 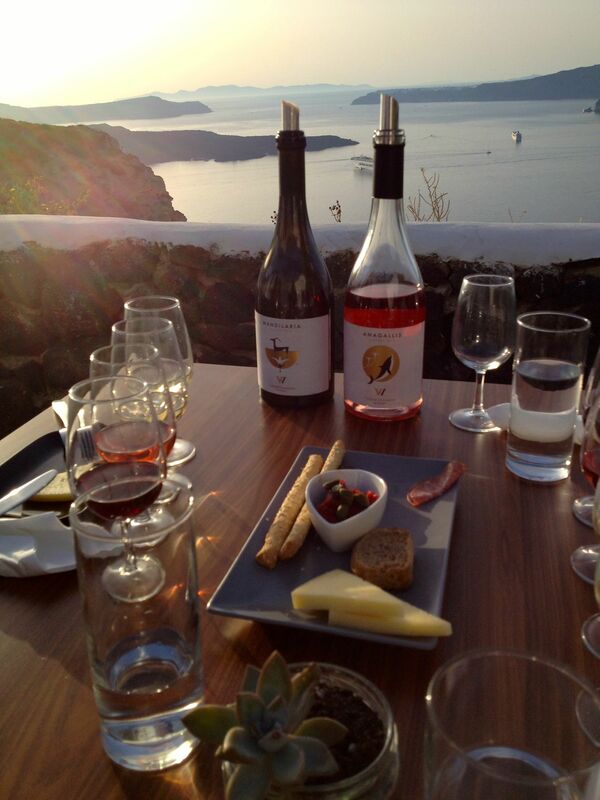 Explore the vineyards and wineries of Santorini. 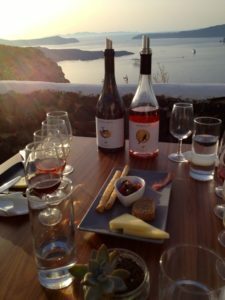 Following breakfast, we will depart for the countryside of Santorini where you will visit distinct wineries and cellars. Learn about the ancient vineyard of Santorini, the history of the island through the centuries and how the volcanic soils influence its winemaking. Winemaking on Santorini dates back more than 4.000 years and the tour covers the most traditional cellars of the island, starting at a vineyard on the volcanic soils. Taste a selection of different wine styles from across Santorini and Greece, such as Assyrtiko, Nykteri and the sublimely sweet Vinsanto wine served with local cheese and olives. The afternoon will be free to enjoy the beauty of the island, or to relax. Free day for you to explore Santorini Island or/and its surroundings. You may rent a bike, a scooter, a car or to take the local buses to go around the island. If you prefer you can go to a next door island called Ios, or just relax by the beach or the pool. Unique Cooking! After breakfast, you will attend to a cooking class at an authentic venue. Learn about the cuisine of the Cycladic Islands and particularly of Santorini, as well as, to the unique local products of our island. In Santorini, with more than 300 days of sunshine and its rich volcanic soil, the island yields a bounty of unusual indigenous herbs and vegetables. White eggplant, capers and caper leaves, fava (small yellow peas), exquisite baby tomatoes - all grown virtually without water. Then, the presentation and the demonstration of different recipes will take place. After we have prepared the dishes, you will be able to enjoy what you cooked accompanied by bottles of delicious wines from Santorini which will be presented to you. The Scent of the Aegean Sea. In the morning, you will be free to relax, to swim or to go shopping. Lunch on your own. In the late afternoon and for our last evening, we will take you to a sunset sailing tour: Swim at the volcanic island and the hot spring! Day 8 – SATURDAY After breakfast, Private Transfer to the port/airport of Santorini. Travel insurance, personal expenses, tips. Your charming little accommodation is a traditional Cycladic Hotel, and it is situated very closed to the famous Caldera which offers amazing breathtaking views, and few minutes away from Fira, the main town and the cultural capital of Santorini. Fira offers a world class variety of boutiques, restaurants and cafes perched at the high rim of the caldera. Many cafes and restaurants offer spectacular views!